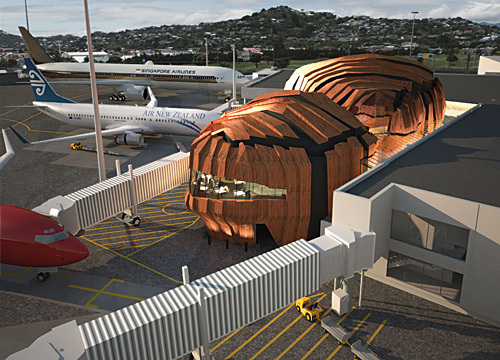 Today Wellington Airport unveiled the design for “The Rock”, an addition to the international terminal. However this is not just a simple expansion/addition, this is to be “New Zealand’s newest icon“. If New Zealand wants to be taken seriously by the rest of the world why do always come up with these crazy gimmicks? While I applaud the architect’s creativity and innovation, as a proud Wellingtonian I would be embarrassed that this is first thing that international visitors will see when they arrive here. Surely for $40 million a nice modern building that fits in well with the rest of the airport could be designed and built? I’m at a loss to find the appropriate words for this monstrosity. I am a young Wellingtonian who is right behind interesting and innovative design for our beautiful city but this has got to be some kind of joke? I don’t know what is “iconic” about a couple of pumpkin like blobs, which is exactly what they will look like to Wellington’s visitors. It will be a memorable visit indeed, but for all the wrong reasons. To be honest I have never seen something more ridiculous. Can someone truly say it is very functional for what Wellington Airport needs? Two big orange blobs is what it is going to look like from space. Surely something else that blends in with its surroundings would be better. It looks like a small Ayers rock in Wellington. While I am an ex Wellingtonian if I still was living there, it wouldn�t get my vote. Why does Wellington have all the fun?! If only Auckland was brave enough to get some �out there� architecture – down with bland buildings! The building clearly has iconic qualities, both because of its prominent location and for the possible image-readings. Most, if not all of the comments refer to the possible alternative interpretations of the building: Turds, pumpkins, walnuts, dust mites, turtle heads…I expect we are just scratching the surface. But as the last decade of contemporary architecture has shown, there is a huge difference between an iconic building and a successful iconic building. Where this project falls short is in the definition of its iconography, and the execution of its aesthetic. 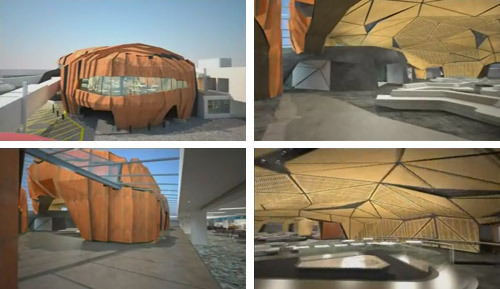 Given the airport environment, the metaphor of the project seems exceedingly arbitrary – the official website description merely states that “the airport�s South Coast location is represented by the inside aesthetics and outside shell of the building.” This seems to fall drastically short of being an effective conceptual background. Despite the very literal and singular brief of “The Rock”, the building mixes the metaphors of shell and rock, and produces an aesthetic that is confusingly abstract. What is so uniquely South Coast about a simple rock, and what is this rock doing in an airport? Is to exert a grounding influence on travellers? Is to show we are stuck in the stone age? It’s possible that the renders themselves are drastically misrepresenting the aesthetic of the exterior. As I understand, the exterior cladding is copper-based, which is a material that 3d modelling programs usually have trouble representing in a realistically. A proper finish would go a long way to dispelling some of the excrement analogies, but I would assume that the building wouldn’t be overtly shiny or deviate from the copper colour too drastically. Despite the issues with the exterior, the interior looks stunning (be sure to watch the fly-through video). Ragged glass lines cut away into the shell, and the panelled facets create an exciting ceiling space. Here it seems that the architecture is acting at its fullest effect, in that it makes superb use of the geology motifs, but without the burden of having to produce a unified image-byte. However, this image-byte is exactly what the building set out to produce, and is the basis upon which it will be remembered and judged. The building is certainly polemical, and I have no doubt that it will become a recognisable landmark – the “icon” that it was created to be. But that should not be a valid programme in itself, the spectacle must succeed at having substance, this is what sets it apart from the legion of other “iconic” projects. The Rock sets out to create a very literal iconography. But the in executing this, it has disregarded context and created an abstract aesthetic that defies the singular premise, ultimately failing at its literal and metaphoric agenda. It is like a Big Duck that doesn’t sell poultry, or a Bilbao without the beautiful ambiguity. The building itself may succeed, but The Rock has been misshapen, misplaced and misinterpreted. Comments taken from here and here. I like the idea, altho I’m not sure they integrate well with the bland white existing structures surrounding them. Such as the gates. 1. Immigration. Huge queues on the way out and the way in. Why not staff these properly? 2. The departure tax. What an embarrassment that NZ can’t build it in to the ticket price the same as every other country in the world. It’s like saying to tourists “thanks for visiting, now we’re going to make you queue up one last time and shake you down for yet another tax before you go… tell all your friends”. And they realise it too… last time I was leaving a couple of Europeans were laughing about having just been forced to “buy the most expensive sticker ever”. 3. Get rid of customs. I don’t see why taking a quick jaunt to Australia gives the government the right to search my possessions without a warrant. And, magically, that’d make flying a much more pleasant experience. More than building a funky new terminal. I am very disappointed in this posting, as I was hoping that this blog would host a thoughtful and considered discussion of design, and not a rehashing of the ignorant comments that are bandied about by the general public who love to trash anything new, provocative, or different. “Is to exert a grounding influence on travellers? I would expect better of someone purporting to provide design critique, than just regurgitating no-nothing talking points. Metaphors in buildings are not literal. If the architects had intended to make a big rock, it would have looked like a big rock. In this case the building is about the qualities of a rock. The crevasses and erosions, the character and beauty that develops over time and with the impact of elements. It amazes me that in a country that takes such pride in its wine, that people can’t see the similarity with architecture. Wines have distinct aromas and tastes that are more complex than what the bottle immediately demonstrates. Some require ageing to come to their full beauty, and take slow consumption to engage the senses and make a proper evaluation. We are accustomed to metaphors in wine, no one reads that a wine has a particular “bouquet” and then says “I don’t see no stinkin’ flowers!” We are guided to look for the fruitiness, or buttery finish, and we take our time to do so. But apparently when it comes to our more permanent physical environment we become college students again -as long as it’s cheap and you can chug it, then that’s good enough. Im am disappointed in myself then jayseatee, as these are the topics that I set out – and thought that I had – addressed. In regards to the public quotes, I did not display them to enforce a particular perspective, or to agree en masse with the public, but as a recognition that the story so far is as much about the public reception as the building itself. In regards to where you quoted me, I think you have misinterpreted those hypotheticals. They are indeed meaningless discussions of architectural form and metaphor, but were only raised because I feel that is exactly what this project represents. Metaphors in buildings can be literal, or here, they can be more implicit than explicit. I certainly don’t have a problem with this, nor with the building’s representation of a rock’s qualities in form (as I said, the interior in particular is a stunning example of this representation). What I do take issue with is the blatant and arbitrary use of this metaphor to justify a spectacle, and nothing more. The project refuses to elaborate on some form of context, meaning, or purpose for its supposed guiding principle. Of what relevance are crevasses to an airport? By using an abstract representation of form, but ultimately choosing a meaningless source, the iconography is hollow. Given this, I feel it cannot help but be at the mercy of public opinion. I’m certainly not trashing anything new, provocative or different just because it is new, proactive or different; but because I feel that these qualities cannot stand by themselves to produce successful project. I’m probably twisting your analogy, but the building is a rich, complex wine with vast potential that is wasted by it’s tacky label and $13.90 price. Im not denying that the project in actuation will be entirely different, or that it will be an “ugly” building. 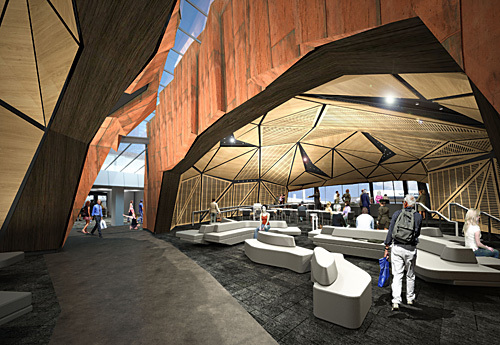 But this discussion is about the now, and all that is available to us are some renders, words and the public response. I’m sorry to be so direct, but some topics are better written as polemics. You are covering the spectacle of the response as if that is the only thing worthy of discussion. This is the ultimate of post modernism – let’s not discuss the actual building and give a proper critique, no, let’s discuss the discussion of the building and give it equivalency to the meaning of the building itself. And how meta is this? Now I’m engaged in a discussion about the discussion about the discussion of the building. I’m sorry, but you have failed to make a pertinent argument about the design. The most critical things you can hurl are statements of personal preference (with the oh so casual reference to excrement), and your key argument regarding iconography is unsupported. The building sets out to be a spectacle – it cannot help but be inherently tied to both its iconography and the public reception thereof – this is undeniably an “iconic” building. Im happy to discuss the building without the iconic baggage. And this is clearly where the building shines, its drama is undeniable. But ultimately, I dont feel that this link between the building and the icon can be severed. As in my closing, the point of my critique was not that the building itself may succeed of fail, but that The Rock has been misshapen, misplaced and misinterpreted. The icon was it’s agenda, and therefore that is what it should be (primarily) judged upon, especially at this stage of the project. I don’t see any point in giving major weight to a critique of the ‘physical’ (non-metaphorical) aspects of the building when they are currently unavailable to evaluate. Im sorry, but I feel that your last statement is as subjective as you accuse me of being. I debated whether to include that reference to excrement, I don’t mean to engage on the public level of critique (by which I mean the “omg it looks like x” comments), merely to report on it. But ill-considered or not, this point is a squirrel, a red herring, an aside. I dont see how my key argument regarding the iconography can be anything but objective. The a rock is an arbitrary metaphor for an airport – is anyone denying this? Even the architects themselvesare not attempting to deny it. It is their own argument for the iconography that is unsupported, they cannot help but fail. But make no mistake, they did make an argument, hence why they are being judged upon it. One of the criticisms that has been aired of the building (ok, one of the many, so far), is that by being such a fixed form, there will be no room or scope for expansion. Now, while we haven’t seen a plan in public yet, that would certainly seem to be a valid comment, although, presumably, one that the architects must have considered. Arguably, one could have leveled the same criticism against the existing building, where the simple answer could be that they planned to extrude the concourse along, if and as when it was needed. That must have been a decision that surely would have been considered, and evidently decided against, for a building form that is is finite, and of its own language. It probably has the original architects, Craig and Moller, left somewhat bemused. I guess however that if and when a need for further expansion is required, they could replicate more of the same here ie more Rock. I think it might be useful to have a further discussion around the word ‘iconic’ because it strikes me that the various users of these words don’t mean the same thing. I can’t help but feel the bog-standard use of ‘iconic’ is a stand-in for marketability, publicity, selling the object to the world to put the place in which the object/building stands “on the map” (to use Kerry P’s phrase). If one wants to be really reductive, it all boils to down to attracting visitors and their dollars. I guess that is not a wholly inappropriate function when we are talking about an airport building, but it is a far cry from architectural symbolism or representation which is what iconic should mean in this context. Jackolantern ~ A Trick or a treat? It is an object placed, rather than a geographical feature which has been birthed in that location. It appears unaffected by its surroundings and they to it; jet-ways plug in, tarmac rolls past, there is no synthesis, no symbiotic running together. Theme-ing the design does not preclude this functional response necessarily but might divert the designer some what. Aren’t rocks made of rock not copper? So a hollow copper rock is what? A kettle? Mimesis in itself does not imply conceptual strength. I’ve never considered what the message airport architecture should convey, but it does occur that if air travel is about links, kinesis, cultural connections, going away, coming home, the romance & wonder of those things, flight and also its practicality and certainty – should not the building reflect that? Can’t the ragged crags of coast line stand testimony to their own sublime majesty and stoic identity without a building copying them to do it? Perhaps i find it hard to like because i find it unattractive visually. Like bad pottery. It’s always hard to decide if something is revolutionary or just a poor effort, so I won’t quite go that far. Heck at least it has polarised opinion and I certainly don’t advocate a default option – perhaps this just isn’t my kind of non-conformist effort. um, you realise from the air it’ll look like the building has a couple of testicles? Part of the problem is that we (the public) don’t have enough information to judge the building qua building: the flyby and two images only show it from the inside and from the runway side. What does it look like from the road, or from the air? The relationship between the two “rocks” might look considerably different from another angle. Also, the rendering doesn’t show the cladding vary well, if it’s going to be copper. For the first week, it will indeed be bright orange, but shiny rather than the flat finish show; thereafter it will be a deeper, mellower bronze/brown, and in a few years it might take on greeny-blue patches of verdigris, and any “pumpkin patch” metaphors will be long gone. It’s appropriate to critique the discussion, especially when the promoters are going out of their way to call it iconic and dub it “the rock”. Foster never called 60 St mary Axe “The Gherkin”, and W&M certainly never thought of “The Cake Tin”, but when the clients and designers of a building give it a descriptive name, the processes of design and marketing become intertwined and it’s valid to investigate that state. All true, but what’s wrong with that? It’s a commercial piece of tourism/business infrastructure, not a government building or community centre, so attracting visitors and their dollars is part of its job. I guess I always go back to the semiotic meaning of “iconic”: a visual image that represents and stands for something, so when applied to a building it’s one where its image automatically calls to mind its host city. The Eiffel Tower, Sydney Opera House, Golden Gate Bridge etc all do that for their respective cities, and the London Eye & Gherkin have perhaps taken over from Tower Bridge, Nelson’s Column etc as symbols of London. Wellington makes do with the Beehive, Majestic Centre, bits of public art in Civic Square and perhaps the view up to St Gerards. Oh, and the Bucket Fountain, of course. So if the rocky pumpkins are aiming for “iconic”, they’ll have to be so memorable that they end up on postcards, T-shirts, album covers, TV stories about Wellington and so forth. It remains to be seen whether the best way to do that is via late-90s style blobitecture. And another definition of “iconic” is that they become destinations in their own right (read: Bilbao Guggenheim). What is the point of having an iconic building at the airport? (if it ever reaches that status). Hordes of people getting off their planes taking photos and then hopping right back on their planes to head to another iconic building / landmark…. Fair points Great Pumpkin. For my part I want iconic objects to occupy a more lofty position, but I guess if shopping/money/commerce etc etc is a new religion then your description is quite appropriate for our age! The other thing I always wonder about when the word iconic is bandied about is can an icon be consciously created? Can something legitimately be described as iconic when it doesn’t exist yet? Wouldn’t it be better to let a building develop a position in the cultural landscape over time and have the potential to cultivate iconic status more organically? Well, I went out of my way to see Saarinen’s old TWA terminal at JFK, and I’m glad I had the chance to have a few cocktails in the LAX Theme Building. I doubt whether this will ever been seen as in the same league, and at least they have some glamour and the imagery of the TWA terminal had a relationship to flight (perhaps a little too literally for some), but there’s certainly an argument for making the building that will be many people’s first experience of Wellington much more exciting than the usual bland terminal. It’s not just our age: Harrod’s, the Empire State Building and any number of bourses around the world have always been celebrations of commerce. Though I think that you’re not so much talking about iconic commercial buildings as the use of iconic buildings (of whatever purpose) to generate tourist revenue. If you think that increasing tourist numbers is a good idea (and I do, since it helps support a thriving hospitality sector and gives me more choice, as well as at least marginally making us more cosmopolitan), then if having an interesting and attractive built environment will attract more visitors, I say go for it. I’m still not convinced that this terminal will do any of that, but I’m going to withhold judgement until I see some better renders. The article in today’s Dom says that the colour will be more natural, and that “While the images showed two “rocks”, the design in fact hosts three, with a smaller one tucked behind the larger ones.” So they could have just picked a very unflattering angle, though one would have thought they’d go out of their way to find the best shots. With a few exceptions, usually of vernacular buildings that are rare survivors of their type, I doubt there are many iconic buildings that weren’t originally intended to be attention-catching. I somehow doubt that the builders of Chartres Cathedral or the Great Pyramids ever intended them to blend in. Slight update; Wellington architects Studio Pacific Architecture in association with Warren and Mahoney have designed both stages of the terminal development. Stirling and Great Pumpkin, some great commentary. Kerryn, there definitely is a distinction to be made between “iconic” as a landmark/postcard/remarkable building, and “iconic” in the semiotic/metaphorical/mimetic sense. But as shown here, using the latter is seen as an easy way to producing the former. Breakfast conversation at a prominent architect�s . . .
Certain buildings leave the heart a-flutter when they’re seen for the first time (and some for the second time and so on). The Sydney Opera House is one of those buildings. So are the Sky Tower, 30 St Mary Axe, the Eiffel Tower and even the Majestic Centre. I can’t see that the Rock will have the same emotional effect. Sure, it will likely be “iconic” in the same way as the Beehive is or the Trolley Buses are but do we need more uninspiring symbols of our city? jayseatee – being new, provocative and different does not mean that its good architecture. Remember also, to use your analogy, not all wine is worth cellaring – some gives you a head ache and makes you throw up. I’m sorry but his ‘wine’ is second rate. doug – your first instinct was right – it is ugly. But I disagree with you on the appearance of the inside – to me it does look like a set from the Flintstones. julian – a agree with you – where is the inspiration – it fails to lift the spirit and excite. SPA, WAM, Lloyd Morrison, Kerry – time to flush these turds into Cook Strait and get serious. Do something serious, do something uplifting, do something beautiful. Julian – oh, be still your fluttering heart! The Majestic Centre? Really!?!?! If thats your impression of good architecture, I feel confident that the Rock will be fantastic.